In Lightroom I see a problem with colors of images exported as SRGB: When viewed with the Windows/XP image and fax display, the colors look much more saturated than in Lightroom. I have a wide-gammut calibrated monitor, and I have the correct display profile installed. I did realize the problem when using images exported from Lightroom in my video editing application: All the colors look over-saturated. 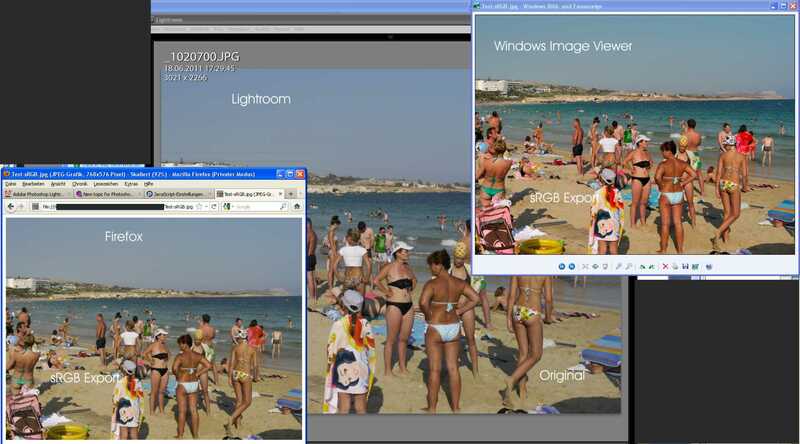 Note that those colors in Firefox are more close to that of Lightroom that those of the Windows viewer are. Windows XP image and fax viewer is not colour managed. Firefox has some colour management which, by the looks of those screenshots, you have turned on. When you view images in non-colour-managed software on a wide gamut monitor, they will look overly saturated. It's not Lightroom's fault, and there's nothing you can do in LR to change that - it's just a result of that combination of hardware/software. 3. ignore it. Other people on normal monitors will see it correctly. P.S: IrfanView is a very good, color managed, free image viewer (you have to switch color management on in preferences). It has been my (and many others) primary image viewer for over 15 years. Hi folks, you surprise me: First I thought the Windows Image viewer actually does color management, and secondly I thought (haven't tried for a long while) that Irfan View does no color management. Not in XP, for sure. I don't know whether that changed for Vista/7.